Lunch time rolls around and we’re getting hungry. The big question????? Is there anything Gluten Free to EAT? Â We walked in, sat down at our table and let the hostess know that I was gluten free and did they have anything that I could eat? She promptly brought the chef over to our table and he walked me through their buffet line, pointing out all the dishes that I could have. It was a very impressive selection. Â I have to tell you that the sirloin was some of the best I have ever had anywhere! If you go, make sure you get the sirloin. The spice rub is fabulous! Here’s my dinner plate pic…. yum yum! I smiled back and said Yes, I would love the recipes! 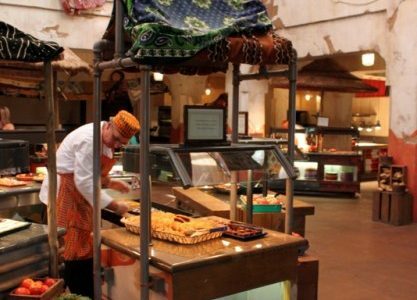 Â So….Â you get the secret recipes from the Tusker House at the Animal Kingdom in Walt Disney World! Â Is that cool or what! Cut the cucumber lengthwise in half and slice thinly. Place it in a medium sized bowl. Remove the core from the tomatoes and cut into medium sized squares ( called dice). Add to the cukes. Â Mix in the remaining ingredients and season with the salt and pepper. Cover and refrigerate for 15 minutes. Serve chilled. Too easy and a very refreshing salad for the summer! If you can’t find fresh mint in the store, no worries! Just go to the local plant nursery, buy a small pot of mint, steal a few leaves for what you need for this salad and then place your cute mint in an indoor garden pot like this one. These work amazingly well, especially when the weather is either too cold or too hot ( which is my problem). Fresh herbs all year round. Just follow the directions. Practically fool proof. Â Keep your plants watered and fertilized and you will have plenty of mint leaves for this dish and to place in your next glass of iced tea. Ps… Kathy here….. I just adore the folks at Disney. They do everything they can to make your stay a “magical” one. I can’t say enough great things about them. Had the same experience. All you have to do is ask and they will get the chef for you to talk to. They have gluten free products in the kitchens. Wonderful experience ! It’s so nice to be able to go and not bring in a shopping cart of food “just in case”.